Iceland left me spellbound when I first visited in 2009. I have been coming every year since, up until 2013. Don’t get me wrong here, my passion for the simple, moon-like design of its landscape has not faded at all. To me, it is somewhat less of a traditional landscape and more of a workspace that can be perfectly decomposed into shapes, structures, lines, patterns and tones. The reason I stopped returning was the enormous hype for photographing the country and its famous spots, apparently fuelled by spectacular images on every social media around. See the stats - in 2009, only 493,000 tourists visited the country. The number grew to almost 800,000 in 2013 and it has banged to over 2 million in 2017. It’s understandable as the place has lots to offer, but for someone who enjoys a solitude and the creative process it has become increasingly difficult to find it. DAY 1 in the air. 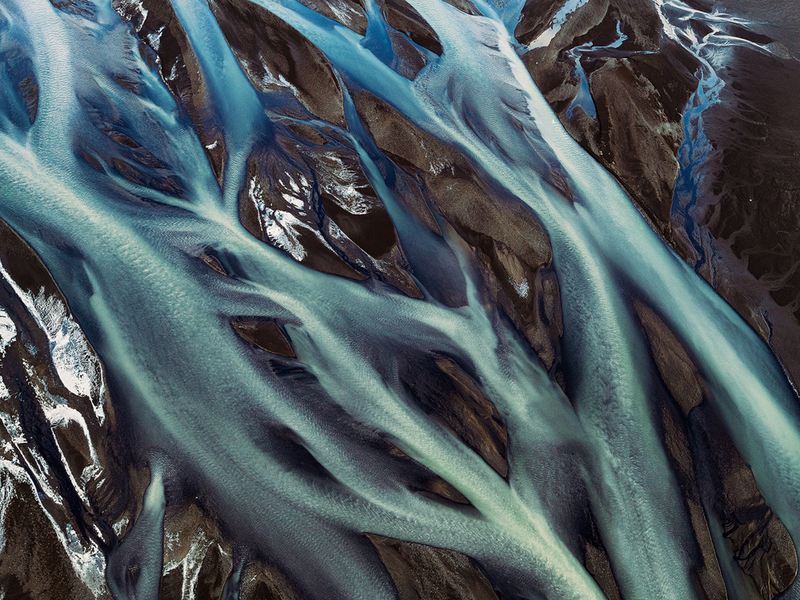 I met Haraldur in Selfoss, the pilot and photographer who flew me over fantastic deltas of south Iceland rivers. Nevertheless, I went again in the beginning of March with the simple plan to stay on the south (despite the crowds but due to the short time) and try to explore different places off the ring road and with my drone. The idea did not quite work out as I was constantly failing to find anything interesting even taking detours to small roads. Ventures deeper into the inland were impossible due to seasonal roadblocks, but it must have been an element of genius loci as well causing that I actually caught myself ending up up in notorious places framing up for the known sceneries. 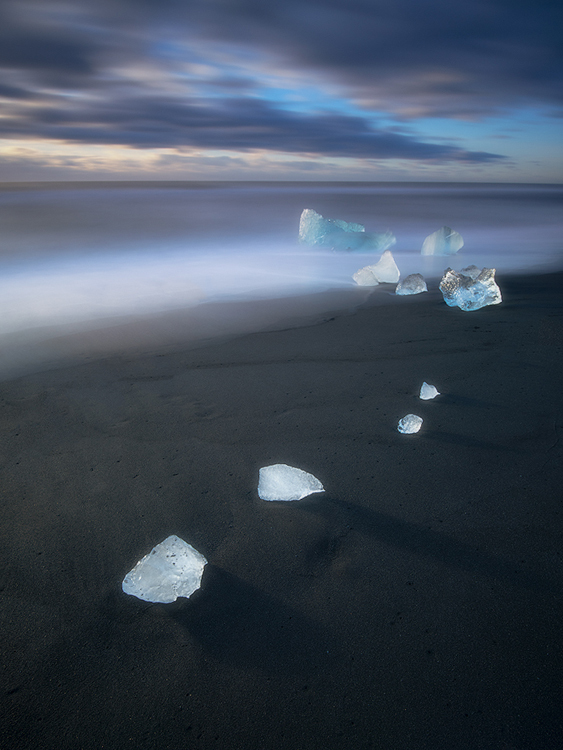 With one difference though - out of curiosity I was counting people on the Diamond Beach near Jokulsarlon on one early morning and I ended up with over 200 bodies. Years back, I was there alone. Things has changed in Iceland since my last trip. The infrastructure continues to be developed, the parking slots are enlarged, the fast food stands number is growing and hotel rooms count is increasing. The gravel parts of the ring road en-route between Hofn and Myvatn are now paved and there is even the tunnel (Vadlaheidargong) significantly shortening the north-west journey back to Reykjavik, which I find a good thing. DAY 3 in the snow storm. I passed near Stokksnes couple of times, but never had a good conditions to photograph it. This time, it was a total snow storm with very limited visibility so I drove further east and this is what I got on the way. My plans are changing. After 3 days between Vik and Jokulsarlon, I decided to check the north and see if the traffic of photographers is less intense. And trust me it is. The road from Hofn is unbelievably empty and the beautiful Fosshotel near Myvatn lake has plenty of free rooms. The places here are deserted in the mornings and I’m finding everything that I could not find in the south. And more. DAY 4 on Námafjall hill. It is a 30 minutes walk, longer than I remember and I almost missed the first light. It’s minus 20, the fumes are freezing on to the ground and my lenses. I have this magic place all for myself. DAY 5 by Aldeyjarfoss. This place is remote and needs a superjeep to get there in the winter. The boys from geotravel.is drove me there. We had a very cold but amazing night with bits of aurora. DAY 6 at Myvatn. I drove around Myvatn having fun with my Mavic 2 Pro done and last light of the day.